There is one other important relationship all moms need, and that is a relationship with The Father. Motherhood is a humbling experience. Teething Toddlers have the ability to bring grown men and women to tears in the middle of the night. And what could be more humbling then raising a child, sacrificing everything for them, only to have them grow up to be teenagers who insist they know everything, rebel against you and make bad decisions, and you have no way to stop them. There are so many moments in motherhood, where all you can simply do is trust The Father and believe that God has a plan. You have to believe that God’s got this, because you sure as heck don’t. In First Peter 5:7, we are told “Cast all your anxiety on Him because He cares for you.” He cares for you, and He cares for your children, because we are all God’s children, and He loves us and will provide for us. My husband and I love this passage and hold firmly to the belief that we cannot borrow worry, we must cast our anxiety on God and trust Him. I often tell myself, they are not our children, but they are His children, and He has blessed us by giving us the opportunity to care for them. I remember spending hours rubbing my growing belli, contemplating the miracle of it all. We waited to be surprised with the gender for our first child and you know how they say that baby girls are born with all the eggs they will ever have. So while I was in my mother, all my future children were already inside me. And now if this baby is a girl, all of her future children are already inside her?!?! Mind Blown! I hope what I have said today will inspire you to be intentional about who you journey with as a mother. Tomorrow is Mother’s Day, and while it is always nice to be honored and pampered by the men in our lives, it is also an opportunity for us as daughters, mothers and grandmothers, sisters and friends seize the opportunity to celebrate each other and our unique relationship with the women in our lives. Let’s celebrate the sisterhood of Motherhood and praise God for the many blessings he gives us. Read my previous posts discussing why moms need other moms to Mentor and Journey with them. This is PART III of my recent remarks for a Mother’s Day Brunch, where I talked about why Moms need other Moms. You can read the beginning HERE and I discuss the importance of mentor moms in Part II HERE. The second important relationship is that MOMS NEED OTHER MOMS who are in their exact same phase of life. It is inevitable, that at some point, a mentor mom will say to you “Enjoy this moment – they grow up so fast” But when you are exhausted and dealing with a moody threenager throwing a fit in Publix or when your teenager has just crashed the family car — the last thing you need is someone to tell you to enjoy THAT moment. You need to be able to vent to other moms who are exactly where you are in life and completely get your frustration. And that is why MOMS NEED OTHER MOMS who are in their phase of life. Nowadays we call this The Birth Club. Whether you actually meet in person at the hospital birthing class, or simple at the park or your child’s school… moms need to be a part of a Birth Club with mom’s whose children are about the same age. We do – it is a need. We are drawn together by this primal instinct of pack survival. It is good for the kids, and it is great for the moms. Play dates are easier – and the conversation can be open and honest. Both my mother and mother in law have friendships that began when they were young mothers, with young children. And now, decades later, they are still friends whom they rely on to talk through the joys of grandkids, worrying about their grown children, or fussing over their husbands. They’ve grow up together, shared the best and worst of life together. Those female friendships are precious. I also look to the many military mom’s I’ve met here as a great example of the importance of this mommy support network. Military wives do an amazing job of caring for each other. They are uniquely positioned to understand each other’s lives, the way civilian women can’t. They form friendships that, like a birth club, help moms survive each day by being a friend who understand exactly where they are. The Bible also talks about the importance of having a Birth Club. Its true! I’ve never gone to seminary, but I was raised in the Catholic church, and growing up we learned a lot about Mary. My favorite story is called The Visitation. In the Gospel of Luke, we learn that immediately after the Angel brings the good news to Mary that she is pregnant with the Son of God, Mary travels to visit her older cousin Elizabeth, who had been thought to have been barren but the Angel told Mary she too is pregnant. Many scholars believe that Mary stayed with Elizabeth through the birth of her son, John the Baptist. But here is what I love about this story – this isn’t just two cousins who are both pregnant helping to care for each other. This is a Birth Club of women in very scary situations. Both women are unexpectedly pregnant – Mary not yet married and Elizabeth much older. Both women have partners who doubt the circumstances of the pregnancies. An angel actually appeared to Elizabeth’s husband and because he voiced doubts the angel command he shall be mute the entire pregnancy! And at this point in the Gospel, the angel has not yet appeared to Joseph, so many scholars think perhaps he was not with Mary during this time. That He stayed back in Nazareth. So both women are confident of the miracle and blessing of their pregnancies, but their husbands doubt, and they have ample reason to fear what outsiders might think. The Gospel of Luke actually says Elizabeth was secluded for 5 months. In my head I just imagine the tears, fear, joy and the unique bond these two women shared. God could have picked any woman to be John the Baptist’s mother, but in choosing Mary’s cousin they were able to be there for each other from the very beginning. They were a Birth Club. And while the relationship isn’t described in the Gospels further, I imagine they remained close as they watched with pride as their sons grew to be preachers, and eventually even shared in the grief of their deaths. The down side of this very primal need of moms to seek out other moms is the comparison game. This can be a downward spiral into a very un healthy relationship. Too often, mothers want to compare rather than support each other. As we saw in the video at the beginning, judging other mothers really just distracts us from our calling to care for our own children. Just as you need to be intentional about choosing your mentor Moms, you need to be intentional about choosing women for your birth club. Don’t get pulled into comparison games, or judgmental groups. Seek out mothers who want to journey with you, and be a friend to them and love their children. The awesome diversity of our MOPS group has taught me that motherhood can be so beautiful when it unites us together, despite our differences and our children’s differences. This is PART II of my recent remarks for a Mother’s Day Brunch, where I talked about why Moms need other Moms. you can read the beginning HERE. The first important relationship that plays an essential role in our own experience and success as mothers is that with Mentor Moms. A mentor mom is any experienced mother who inspires, teaches or motivates us. They are the women we turn to for parenting advice big and small. From what bouncer to register for to what preschool to attend. For advice on adjusting to life as an empty-nester or advice on dealing with a grown adult child who has moved back home. No matter what stage of parenting you are in, you will need a Mentor Mom or two on speed dial. Many of us are lucky enough to call our own mother’s Mentor Moms. Personally, I count myself as one of the very lucky ones, because both my mother and mother-in-law are tremendous resources for me, and have supported me through every step of my journey. If I can be half the mom they are, I will be doing ok! The mother daughter relationship is so special, because we were once a part of her, and she is forever a part of us. But this relationship is really divided into two parts. The first half is when one is a mother and the other is just a daughter. This part is special and wonderful, but it is also known to be a difficult relationship at times. Particularly around the teenage years. I was the youngest of five and my mother was, as they say, of “Advanced Maternal Age” when I was born. This meant that when I was entering my dreaded preteen years, she was beginning menopause. The result was a perfect storm of female hormones, that my poor father had to navigate through very carefully. But like magic, there is a clarity of understanding when the daughter matures and becomes a mother herself. They then enter the second half of the Mother-Daughter Relationships, when they are joined in the Sisterhood of Motherhood. For most women, when the going really gets tough, there is only person they want to turn to, and that is their mom. Of course not all women consider their mother a Mentor— sometimes women are “inspired” to do things differently. And of course not all of what mentor moms teach us is a formal conversation or lesson, but rather knowledge that we gain simply by observing them. Values and traditions we then try to embody and hope will carry on with our own children. 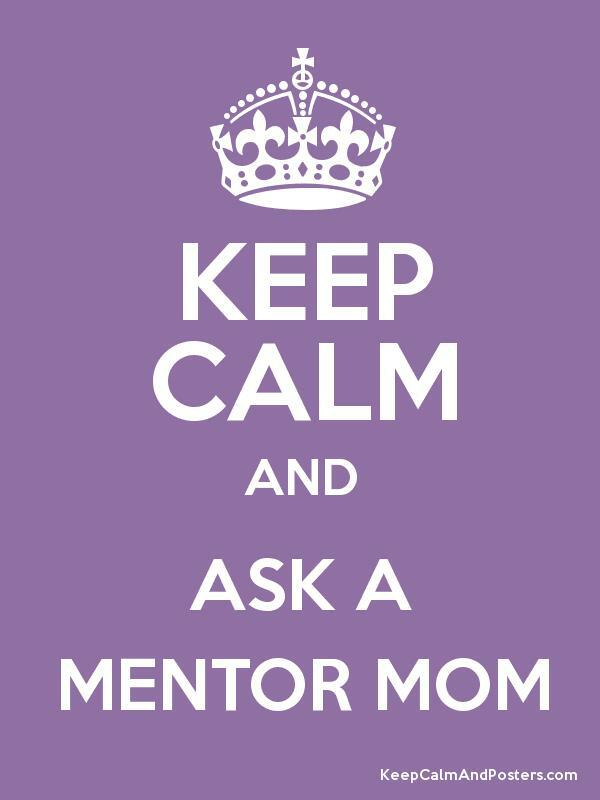 There are many women whom I consider a mentor mom who probably don’t even know they fulfill that role for me…. neighbors, other MOPS mommas, and women I’ve met in my career or in the community who inspire me. In MOPS we really value Mentor Moms who join our groups and help provide our young momma’s, who are deep in the trenches of toddler warfare, a compassionate ear, sound advice and even a shoulder to cry on. Perhaps most importantly, they provide knowledge that only comes from experience. Sometimes Google, WebMD and Mommy blogs or Facebook groups provide quick and easy answers, but they are not always the best idea…. you can get sucked into debates, or fed faulty knowledge too easy. Be intentional AND discerning in your choice of who you learn from. That is not to say online forums are not legit sources of information… they can be a wonderful resource. Especially in the middle of the night when you really don’t want to call your own mother. But there is something to be said for speaking with your mother, or sister or neighbor or friend, and having a conversation. So much of mothering is not just about the issue we face with our child, but how we are handling it as well. There is no textbook for how to be a good mom, but there is a long, rich oral history that we share generation to generation, and mom to mom, that when heeded can build on your natural instincts and personal beliefs to make you a better mom. I was honored to be asked to speak at a Mother’s Day Brunch yesterday at my church. I am sure they asked me because for the last year I was one of the co-coordinators for our MOPS group, but I also like to think its because of my EVPHO title, which let them know I take this whole Mommy gig seriously. More than likely, my church family simple knows I am obsessed with being a mom, and prone to talk to any stranger on the street who will listen about the joys of motherhood. I’ve convinced more than a few friends than having two kids close together is soooo easy and wonderful. They know who they are, and you’re welcome. At first, you watch this and think, “Ugh, this is the worst of what motherhood can be,” which is lonely and judgmental. It began with the lone mother, arriving at the park. Full of new mommy fears – wanting to do what is best for her child, that she loves more than anything. Quickly we see that the different parenting styles lead to division and hostility, rather than empathy and friendship. The one group they left out, in my opinion, is the Grandparent group – they should have had a gaggle of grandmas watching from the sidelines shaking their heads. Of course the point of this video is that we are all parents. We are all mothers. And we all want what is best for our children at the end of the day, right? RIGHT! If we could all approach motherhood as a sisterhood, a uniting factor that brings us together, we would find abundant blessings in our relationships with other moms. We have so much to learn from each other. Because the reality is, whether you are a working mom or a stay at home mom; a mom with young children or an experienced mom with grown children – Motherhood is not something we can do on instinct alone. It’s just not. Mom’s need other moms. Moms need other moms to mentor them, and mom’s need other moms to support them and help them as they go on the journey. Raising children is an incredibly complex, demanding job. Mother’s instinct is amazing – and I certainly believe in that gut feeling that so often props me to act on my child’s behalf. But instinct alone does not give us all the tools, guidance and support that we need to navigate the daily grab bag of random issues you will face as a mom. There is no major in college, no HomeEc course and no amount of time spent reading parenting books that can give you all the answers you will need. And while I dearly love our pediatrician, and he is a wealth of knowledge, Doctors often help diagnose a child’s needs, but it is up to us as moms to figure out how to tackle those needs on a daily, sometimes hourly basis – and for that, we must rely on the sisterhood of motherhood. Just ask any parent with a special needs child, or a brand new momma struggling to breastfeed. They turn to other moms for advice, or even just encouragement that their struggles are normal and really they are doing just fine. We need other moms to mentor us and teach us, and we need other mom’s to support us and see us through the scary, exhausting and ridiculous moments of motherhood that only other mother’s will understand. In this day and age, many women feel they need to be a Super Mom – juggling kids, cooking, cleaning, a job, being a perfect wife – and they think they should be able to do all of this on their own. I would counter that nothing could be farther from the truth. Moms need other moms, and we need them now more than ever. Women have always rallied around each other to help with childrearing – in many cultures throughout history a new mom was afforded a great deal of help in those difficult postpartum months. Mothers, sisters, neighbors, aunts move in and help cook, clean and care for older children and their husbands. In fact life in general has almost always been more communal than what it is today, with extend families living closely and integrated into each other daily lives. I have often joked that I would love to go back to the days of tribal living or set up some kind of mommy Co-op where neighbors rotate nights cooking, we all supervise the children running around the neighborhood and feel as much an obligation to care for their children as we do our own. But today… what do we have? Today we have world where if a young child is playing outside on their own in front yard while you are inside cooking dinner, you might have a nosey neighbor come knock on your door and scold you about letting your kids playing outside alone. That neighbor, too many like them, make mothers and parents feel like it is solely our responsibility to care for our children, 24/7, and that they bare no responsibility at all. The reason Hillary Clinton had to reemphasize the “It takes a village” mentality is because sadly, in America today we have gotten far, far away from that. We live in our own little McMansions. Our own little fiefdoms. That support network from days gone by has long since fallen apart. So over my next two or three posts, I’m going to continue this discussion of why Moms need other Moms. These are important relationships that play essential roles in our own experience and success as mothers, and I hope you’ll keep reading and share your thoughts!